CBD vs. THC: Why Is CBD Not Psychoactive? Home / Uncategorized / CBD vs. THC: Why Is CBD Not Psychoactive? Why is THC psychoactive and CBD is not? How can one cannabinoid alter the mind so profoundly, and the other seemingly not at all? When we’re talking about cannabis and psychoactivity, we’re dealing exclusively with CB1 receptors, which are concentrated in the brain and the central nervous system. The difference between CBD vs. THC comes down to a basic difference in how each one interacts with the cannabinoid 1 (CB1) receptor. THC binds well with CB1 cannabinoid receptors. CBD has low binding affinity for CB1 receptors. That’s where the two diverge. Think of it like an electrical plug connecting to a wall socket. A THC molecule is perfectly shaped to connect with CB1 receptors. 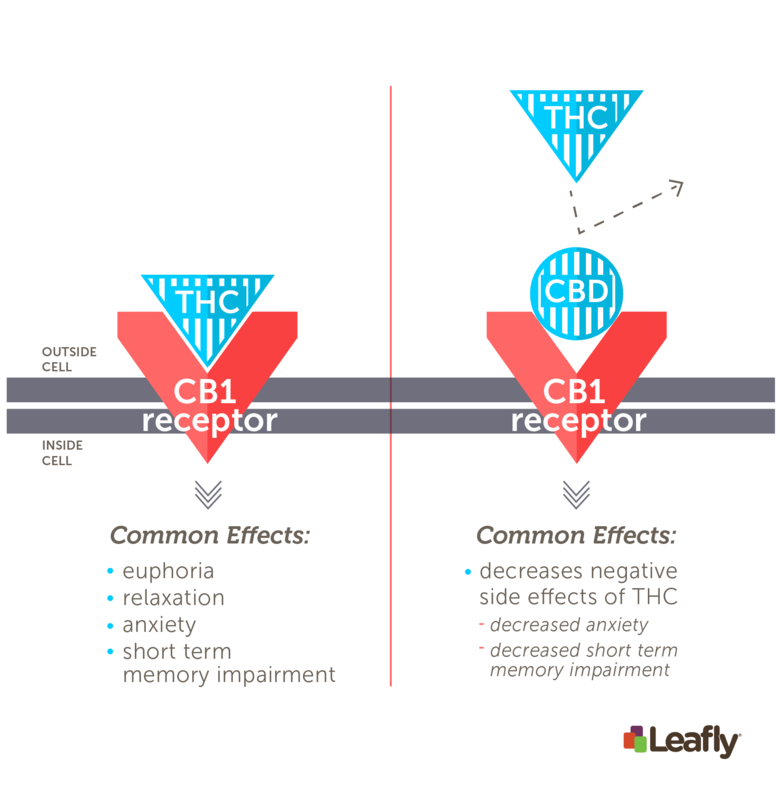 When that connection happens, THC activates, or stimulates, those CB1 receptors. Researchers call THC a CB1 receptor agonist, which means THC works to activate those CB1 receptors. THC partially mimics a naturally produced neurotransmitter known as anandamide, aka “the bliss molecule.” Anandamide is an endocannabinoid which activates CB1 receptors. Animal studies have taught us that anandamide can increase appetite and enhance pleasure associated with food consumption, and it’s likely responsible for some of the rewarding effects of exercise (e.g. the “runner’s high”). Anandamide also plays a role in memory, motivation, and pain. THC is a “key” that so closely resembles anandamide that it activates CB1 receptors, allowing it to produce some of those same blissful feelings. Left: THC directly stimulates the CB1 receptor. This interaction underlies the major psychoactive effects of Cannabis consumption. Right: CBD reduces, or “antagonizes,” THC’s ability to stimulate CB1 receptors. This can decrease some of THC’s effects, especially negative effects like anxiety and short-term memory impairment. How does that work in real life? Let’s say you vaporize cannabis flower with 24 percent THC. If that flower has 0.2 percent CBD, the THC is going to excite your CB1 receptors with almost no interference from CBD. You may feel extremely high, and you might also experience some of the less desirable effects of THC, such as a heightened feeling of paranoia. If you consume cannabis with 24 percent THC and 6 percent CBD, though, the CBD should have a dampening effect on the THC. You’ll still feel high, but perhaps not stupefyingly so—and the CBD should help keep the paranoia in check. This difference in psychoactivity has had profound political implications. As the founders of Project CBD have noted, some have mistakenly labeled THC the “bad cannabinoid” and CBD the “good cannabinoid.” Legislators have passed many “CBD-only” laws in Southern states in an effort to allow patients access to this potent cannabinoid while prohibiting its psychoactive sibling. 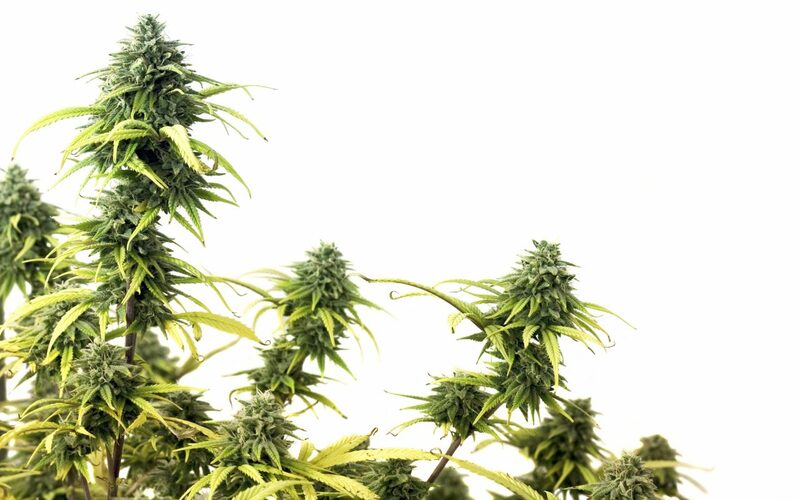 But the pioneering cannabis researcher Raphael Mechoulam has often spoken of the “entourage effect,” the idea that cannabinoids and terpenes may work better together than in isolation. The GW Pharma product Sativex, for example, is a drug approved outside the U.S. for treatment of MS-related muscle spasticity. Sativex contains with a nearly 1:1 CBD-to-THC ratio. As researchers learn more about CBD and the role of other cannabinoids and compounds in the treatment of conditions like MS, we may be able to more accurately dose CBD in combination with other cannabis-derived compounds. Product descriptions and images presented on the site are for representational use only and do not constitute or substitute for medical information from your health care or medical professional. Information on this site is provided for informational purposes only. You should read carefully all on correct product packaging and follow the instructions. If you have or suspect that you have a medical problem, promptly contact your health care provider. Information and statements regarding dietary supplements on this site have not been evaluated by the Food and Drug Administration and are not intended to diagnose, treat, cure, or prevent any disease and may be for commercial. Image shown for reference only. Actual item you receive may differ from shown. © 2017 viperrx. All rights reserved.